Seminars are normally held in the Physical Sciences Building room 401 on Wednesdays at 2 pm and on Fridays at 12:30 pm (pizza at 12 noon). Click here for information to help speakers planning their trip to Ithaca. For more information please contact Sungwoo Hong (sh768@cornell.edu), Edgar Shaghoulian (es947@cornell.edu), or Katerina Malysheva (evm23@cornell.edu). 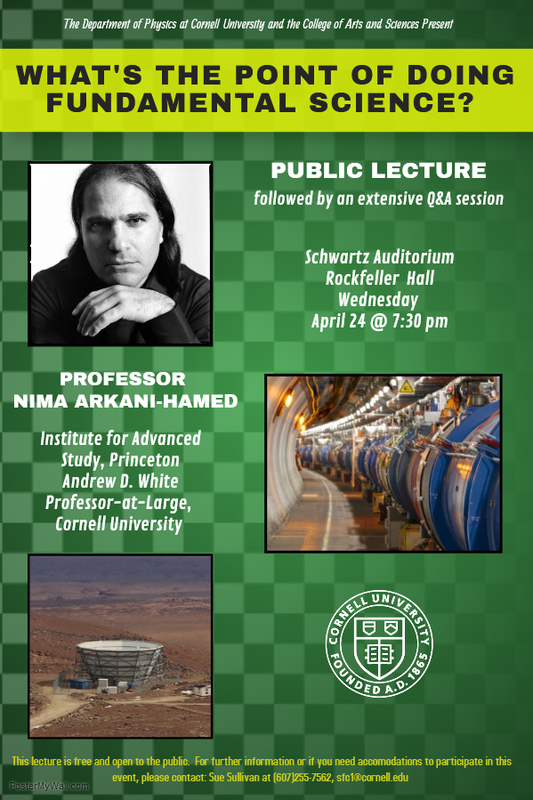 Fri Sep 29 Nima Arkani-Hamed IAS Joint Experimental and Theory Seminar in Particle Physics and Cosmology: UV/IR Correlations Solve Fine- Tuning Problems? Archive of previous seminars are available.